Labour frontbencher Emily Thornberry risked enraging voters today by claiming they are only backing Theresa Maybecause they like her hair. The close Corbyn ally implied that Britons are letting shallow opinions influence their political choices. She made the comments on ITV's Peston on Sunday as she insisted that Labourwill win the General Election despite their humiliating defeat in local elections earlier this week. She said: 'We will win this, if we win it, on the basis of our policies and the fact that we have been able to get over our message on the doorstep showing people that it does not need to be this way. 'There is no alternative vision that the Tories are offering. It is not good enough for people to simply say 'I like Theresa May's hair' or 'I like that shade of blue'. Theresa May unveiled her new softer cropped bob in January, but voters will undoubtedly find it insulating to suggest that is why they are swinging behind her. It is not the first time the shadow foreign secretary has scoffed at the public over their politics. She was sacked as shadow attorney general in 2014 by Ed Miliband after sneering at a family home draped with an England flag. 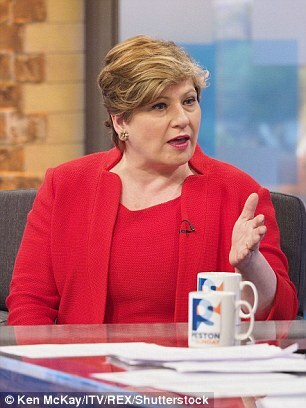 Ms Thornberry, who lives in a multimillion pound house in Islington, north London, was sent to tour the TV studios to speak in support of Labour's plans to raise taxes on those earning more than £80,000. But she admitted she did not know how much Labour's 'modest' rise would raise and refused to say whether tax relief on pensions would be cut. Explaining why the £80,000 threshold had been chosen, she acknowledged that 'many people on £70,000 do not necessarily feel themselves to be rich, but the truth is average incomes are £26,000'. And she defended Mr Corbyn's leadership: 'He is genuine, he talks like people talk and his preoccupations are the preoccupations of ordinary people.